We’d love your help. Let us know what’s wrong with this preview of The Secrets of Alchemy by Lawrence M. Principe. Alchemy, the “Noble Art,” conjures up scenes of mysterious, dimly lit laboratories populated with bearded old men stirring cauldrons. Though the history of alchemy is intricately linked to the history of chemistry, alchemy has nonetheless often been dismissed as the realm of myth and magic, or fraud and pseudoscience. And while its themes and ideas persist in some expected Alchemy, the “Noble Art,” conjures up scenes of mysterious, dimly lit laboratories populated with bearded old men stirring cauldrons. Though the history of alchemy is intricately linked to the history of chemistry, alchemy has nonetheless often been dismissed as the realm of myth and magic, or fraud and pseudoscience. And while its themes and ideas persist in some expected and unexpected places, from the Philosophers’ (or Sorcerer’s) Stone of Harry Potter to the self-help mantra of transformation, there has not been a serious, accessible, and up-to-date look at the complete history and influence of alchemy until now. A concise but illuminating history, The Secrets of Alchemy is written for anyone drawn to the alchemical arts, those who are fascinated by the science as well as the fantastic stories and mysterious practitioners. To ask other readers questions about The Secrets of Alchemy, please sign up. Lawrence M. Principe realmente entende do que está escrevendo. O livro passa pelo começo da alquimia até o seu fim, ou declínio, com o começo da ciência moderna. E o autor faz um excelente trabalho de explicar não só o que os alquimistas pensavam, como porque eles pensavam o que pensavam. Ao invés de ficar na exposição das ideias, na linha do "olha que ridículo o que achavam", suas explicações vão na linha do "claro que isso fazia sentido quando a referência que tinham desse processo na época er Lawrence M. Principe realmente entende do que está escrevendo. O livro passa pelo começo da alquimia até o seu fim, ou declínio, com o começo da ciência moderna. E o autor faz um excelente trabalho de explicar não só o que os alquimistas pensavam, como porque eles pensavam o que pensavam. Ao invés de ficar na exposição das ideias, na linha do "olha que ridículo o que achavam", suas explicações vão na linha do "claro que isso fazia sentido quando a referência que tinham desse processo na época era essa". Like most modern people, I've thought of alchemy as something more magic than science, but Principe manages to walk us back to a time when science, philosophy, religion (and some slight of hand) were intertwined. Using the term "chymistry" to over-ride our our internal definitions of chemistry and alchemy, he presents an interesting history of the history of alchemy and the infancy of chemistry. Delightful! Exactly what I hoped for. This book is exactly what I was hoping for: a casually readable but serious investigation of the history of alchemy, explanation of their arcane language, chemical foundations, and especially a telescope onto the mind of proto-scientific mankind. The book is very well written and easily readable, but so delightfully informative. The author’s own experiments with centuries-old alchemical recipes was the icing on the cake—to understand the old methods with 21st Delightful! Exactly what I hoped for. This was a really fascinating book. I primarily wanted to read it for more cursory knowledge of the 17th and 18th centuries (knowing that Alchemy was in the midst of a golden age at that point) but found so much more. With a background in chemistry the author (Lawrence Princip) is able to approach the highly overly mysticised subject of Alchemy, not falling into the trap of flippant dismissal or over-exhuberant delusions, instead approaching in rational terms and revealing the true craft and inte This was a really fascinating book. I primarily wanted to read it for more cursory knowledge of the 17th and 18th centuries (knowing that Alchemy was in the midst of a golden age at that point) but found so much more. A brief but rich history of the historical, philosophical and scientific development of alchemy and how it eventually branched off into both chemistry and mysticism. Principe does a great job of bringing out representative texts regarding the discipline from Greek times to the 19th Century and even reproduces a number of alchemical "recipes" in his laboratory in order to determine where science ends and speculation begins. A great introduction. A fantastic overview of alchemy as a long-standing tradition rooted in logic, reason, and experimentation, later tainted by quackery (a well-earned status thanks to some practitioners, no doubt), and eventually re-interpreted as pseudo-science, mysticism, and psychological fantasy. Worth the read for the scientist and the mystic alike! 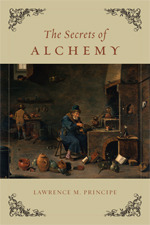 Interesting read providing a scholarly overview of the history of alchemy and its relationship to modern day chemistry. In some of the most interesting parts of the book the author attempts to recreate alchemical experiments in order to understand their reported observations. Interesting and informative. It is by no means (as the author himself states), a thorough treatise on the subject of alchemy. What he set out to do, he did very well, I thought. This book provides an excellent overview of a rather broad subject. Principe's book is very good, from the standpoint of a history of science. And for this very reason it fails to explain what were the cultural reasons for the belief in alchemy. As we can see, many of the described experiments of the alchemists rest on purely observational things: the "Hermes' Tree" is nothing but a reaction inside a tube that grows in a tree-like shape. This, however, is not sufficient. Principe - as the rest of the authors that follow a strictly "scientific history" agenda - d Principe's book is very good, from the standpoint of a history of science. And for this very reason it fails to explain what were the cultural reasons for the belief in alchemy. As we can see, many of the described experiments of the alchemists rest on purely observational things: the "Hermes' Tree" is nothing but a reaction inside a tube that grows in a tree-like shape. This, however, is not sufficient. Principe - as the rest of the authors that follow a strictly "scientific history" agenda - does not get into the historical mental issues that made possible and, more importantly, believable for someone to see a tree where for us there is only a chemical reaction. The standpoint of the history of science is very good in explaining the main scientific and philosophical strains that alchemy followed from Antiquity to the Modern Age. But they choose to ignore more anthropological and sociological reasons for the belief in alchemy: it is not enough to know what materially happened behind the mystical words of an alchemical text; there has to be an explanation that accounts for what happened mentally too. This has been attempted (and later, shunned by these very historians of science) since Marcel Mauss' and Henri Hubert's "Esquisse d'une théorie générale de la magie" ("A general theory of magic"). The French social scientists gave way to Mircea Eliade's famous interpretation in "Forgerons et alchimistes" ("The forge and the crucible"), not to mention the relevant - although historically flawed - jungian interpretation. Is it a paradox to say that a book titled The Secrets of Alchemy is open and brisk? Treatments of alchemy to this point have been either rationalist dismissals of the practice and all it represented, or dense historical works that get as lost in the details as the alchemists themselves did. In this book, Lawrence M. Principe lays out a targeted and clear (at least, as much as is possible!) history of the subject. He actually tried to carry out the described experiments, and when he encountered f Is it a paradox to say that a book titled The Secrets of Alchemy is open and brisk? Treatments of alchemy to this point have been either rationalist dismissals of the practice and all it represented, or dense historical works that get as lost in the details as the alchemists themselves did. In this book, Lawrence M. Principe lays out a targeted and clear (at least, as much as is possible!) history of the subject. He actually tried to carry out the described experiments, and when he encountered frustration, he persevered (sounds like normal lab work) and eventually it worked like they said in many cases. Not Philsopher's Stone cases ... but he did make a "Philsopher's Tree", which is quite wondrous in itself. If you want to really know about alchemy and what it was, read this book. I can't recommend it highly enough for answering that question. Because the alchemists were always not quite trusted, and because they did much work in the sixteenth through eighteenth centuries as the Enlightenment was emerging and drawing its lines, they have been caught on the wrong side of those lines for a long time. Some deservedly so, but Principe's experiments show that there was some surprisingly sophisticated experimental chemistry going on. And not to mention Carl Jung's life's work refuted in a mere 20 pages! Well done, Lawrence. Many of the pieces necessary to understand the esoteric side of alchemy are here: Mesmer's animal magnetism/Jung's libido, Christian and Greek mythology, layers of meaning, interconnectedness of all things within and without, above and below (spirit and matter), Chaucer, Jonson, Donne, Shakespeare, Rowling - he even includes Fludd's image of the Great Chain of Being that echoes the Tree of Life on page 197 and Valentine's Azoth on page 120! - but, unfortunately, he doesn't quite come away with the "secrets" of alchemy in the end, and neither do we. The first thing to note about this book is that the title is somewhat misleading. It would be more accurate to call it a history of alchemy. I was nearly put off buying it because of its title, but in retrospect I'm glad I wasn't, because it's a very interesting book. What the author sets out to do is to restore an understanding alchemy of within its historical and cultural framework. I think he succeeds in this aim. There is in Western society a tendency to think of alchemy as being something va The first thing to note about this book is that the title is somewhat misleading. It would be more accurate to call it a history of alchemy. I was nearly put off buying it because of its title, but in retrospect I'm glad I wasn't, because it's a very interesting book. What the author sets out to do is to restore an understanding alchemy of within its historical and cultural framework. I think he succeeds in this aim. There is in Western society a tendency to think of alchemy as being something vaguely to do with magic - but nothing could be further from the truth. The work of most alchemists would be recognized today as experimentally rigorous, and based on the best theories of the nature of matter that existed at the time. Take, for instance, the search for the legendary Philosopher's Stone, the secret of turning lead into gold. We know that's not possible to do chemically today. Why do we know that? Because we know that lead and gold are elements. The elements are defined by the number of protons in their nucleus. Chemical reactions only work on the electrons in atoms, and you can't change the make-up of an atomic nucleus by fiddling with its electrons. The book covers the history of alchemy from its beginnings in the third century AD through to its effective demise at the end of the 19th Century. Along the way it discusses many other aspects of alchemy, including its impact on early medicine, laboratory work, and chemistry. It also looks in more depth at some of the work of famous alchemists, including the attempts of the author to recreate their work in the lab - with interesting results. Well worth a read if you have any interest in the history of science. This book provides a remarkably clear and readable history of alchemy from ancient to modern times. That's not to say that everything about alchemy is or can be clarified, but the author does an impressive job of conveying what scholars have learned (he points out that many recent books repeat errors that had long ago been cleared up by scholars writing in other languages) and places alchemical practices within their historical context(s). Rather dazzlingly, he even manages to unravel some of th This book provides a remarkably clear and readable history of alchemy from ancient to modern times. That's not to say that everything about alchemy is or can be clarified, but the author does an impressive job of conveying what scholars have learned (he points out that many recent books repeat errors that had long ago been cleared up by scholars writing in other languages) and places alchemical practices within their historical context(s). Rather dazzlingly, he even manages to unravel some of the obscurantist language used for alchemical writings and to duplicate some of the recipes in the lab. The book is largely but not entirely chronological in organization, and while the author's reasons for discussing recent (19th century to present) beliefs about alchemy before covering Golden Age alchemy do make some sense, by the end I felt it was a mistake to abandon chronology. While the notion that alchemy was really about personal transformation and not chemistry may date to the 19th century, the section on the Golden Age makes clear that by that time ideas of alchemical transformation already extended (at least for some people) beyond the purely chemical. What I thought was a book on the history of an occult subject, turned out to be to my surprise, was a book on the history of science! Chemistry specifically. And it was a great surprise. Turns out, alchemist were not pitiful tinkerers wasting time on an impossible goal. They were serious scientist for their time; at least how science at the time was understood. Before atomic theory, there was no reason why you could not to base metals into gold. Also, to my surprise, all that talk of alchemists conc What I thought was a book on the history of an occult subject, turned out to be to my surprise, was a book on the history of science! Chemistry specifically. And it was a great surprise. The author, like a detective, recreates in his lab experiments that were performed by alchemists. concealed in their strange images and references. This is an exciting and much needed book for both specialists and the general reader. Very good high level review of the many eras of alchemy. Of course I'm biased because I though Prof. Principe was a great Organic Chemistry I and II professor back at Hopkins. I found it very interesting in how Dr. Principe relayed the results of performing the alchemical experiments in his own lab. He brought the reader through "disinformation" and hidden meaning of the original alchemists and explained how images in contemporary texts could be actual reagents. Dr. Principe took the mostly chron Very good high level review of the many eras of alchemy. Of course I'm biased because I though Prof. Principe was a great Organic Chemistry I and II professor back at Hopkins. I found it very interesting in how Dr. Principe relayed the results of performing the alchemical experiments in his own lab. He brought the reader through "disinformation" and hidden meaning of the original alchemists and explained how images in contemporary texts could be actual reagents. Dr. Principe took the mostly chronological tour of alchemy, except at the end where he put the modern chemical critiques of alchemy before the 17th to 18th century analysis. I think this worked well. This book lives up to its name - you will learn how to create the Philosopher's Stone. The downside is, it will also tell you how the mythology surrounding the fabled object came to be, and why it never worked as advertised. Not a fun or easy read - the author's style is quite dry, almost deliberately avoiding any sign of awe and wonder, no doubt to lend gravitas to a subject that has seen more than its fair share of fantasy and hyperbole over the years. In fact, so great are the lengths the aut This book lives up to its name - you will learn how to create the Philosopher's Stone. The downside is, it will also tell you how the mythology surrounding the fabled object came to be, and why it never worked as advertised. Not a fun or easy read - the author's style is quite dry, almost deliberately avoiding any sign of awe and wonder, no doubt to lend gravitas to a subject that has seen more than its fair share of fantasy and hyperbole over the years. In fact, so great are the lengths the author goes to create a serious, practical tone that it can often be a tough read. A useful and interesting introduction to the history of alchemy. Principe examines the theory and practice of alchemy over two millennia and makes the always useful point that people in the past did not think in the same way as we do. I've been researching the history of alchemy for a novel I'm writing and this is the first and only concise history I've found on this overwhelming topic. If you're interested in the history of medieval and early modern alchemy (as opposed to modern/spiritual interpretations) START HERE! One of the best "history of science" books I've ever read. It's well written, carefully researched, and really helped me understand this science from the perspective of those who practiced it. Academic book - interesting but perhaps too scholarly for casual reading - dry in spots. Enlightening history of chemistry from a perspective rarely taken.